This was fun -- an updating of the original TMNT #1 cover for our fiftieth issue. I had a great time doing these tight pencils back in 1992, and Kevin did a great job of inking (and then painting) them. It’s funny to compare the way the turtles looked in the first cover to the way they look here -- definite changes over time. Thats one of my favorite comic covers, did you talk to kevin at all at the NYCC? Man, they sure have come along way. I'm glad they are still around. The TMNT are one of my favorites of all time, and I'm glad you guys came up with them all those years ago. The only comic book charachter I like on the same level is Batman. Thanks for sharing these Pete. This needs to be a new horizontal poster. I know that there's the "City at War" poster available on the Mirage website, but the quality along with the orientation and words over the art is not that great (I bought one years ago). -->> ..with Mr. Weasel there. The pencils alone are a "PIECE" amongst themselves. It's funny how the comic book turtles always felt like they belonged on the rooftops (in large part becuase of these covers) while the original cartoon turtles always belonged in the sewers. The recent CGI movie had a nice mix of both. Thats one of my favorite comic covers, did you talk to kevin at all at the NYCC?" Speaking of which, am I right in reading there is going to be another reprint of issue #1 for the Free Comic Day this year Peter? If so, will it be available at participating comic stores? 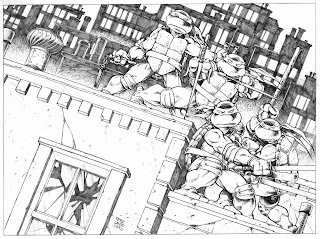 Just wondering if any will make their way to the UK..."
I've always wondered, is Michelangelo supposed to be giving Raph bunny ears with his 'chucks in that pose? I've always wondered, is Michelangelo supposed to be giving Raph bunny ears with his 'chucks in that pose?"